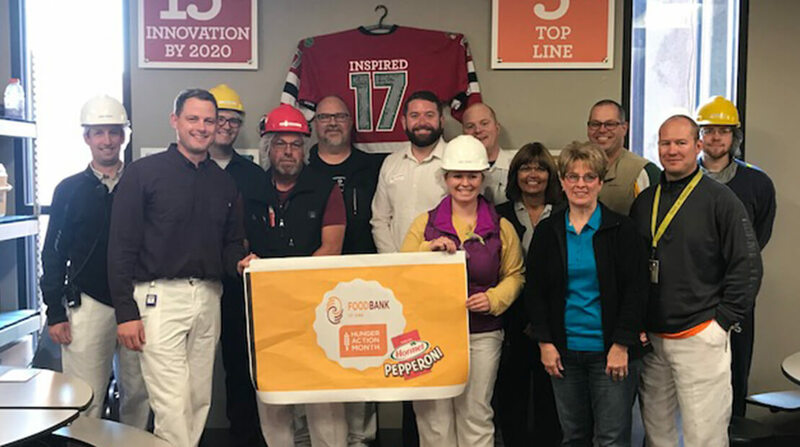 The Algona (Iowa) Plant of Hormel Foods Corporation (NYSE: HRL), announced today that it has donated $10,000 to the Food Bank of Iowa to help fight hunger in the community. This is the eighth consecutive year Hormel Foods has given funds to its locations to share with nonprofits in their respective communities to fight hunger. In 2017, Hormel Foods donated $300,000 to local hunger relief organizations in 30 U.S. communities, bringing the program’s total contribution to local hunger relief efforts to more than $2 million thus far. Through this program as well as disaster relief efforts and other donations, Hormel Foods contributed $5.4 million in cash and product donations to help address hunger in 2017. Additional information about the company’s fiscal 2017 hunger relief efforts is available in the Hormel Foods 2017 Corporate Responsibility Report. Hormel Foods Corporation, based in Austin, Minn., is a global branded food company with over $9 billion in annual revenues across 75 countries worldwide. Its brands include SKIPPY®, SPAM®, Hormel® Natural Choice®, Applegate®, Justin’s®, Columbus®, Wholly Guacamole®, Hormel® Black Label® and more than 30 other beloved brands. The company is a member of the S&P 500 Index and the S&P 500 Dividend Aristocrats, was named one of “The 100 Best Corporate Citizens” by Corporate Responsibility Magazine for the tenth year in a row, and has received numerous other awards and accolades for its corporate responsibility and community service efforts. In 2016, the company celebrated its 125th anniversary and announced its new vision for the future – Inspired People. Inspired Food.™ – focusing on its legacy of innovation. For more information, visit www.hormelfoods.com and https://csr.hormelfoods.com/.